Many small businesses in the Indianapolis area depend on commercial vans to complete jobs and expand their customer base. Commercial vans have the ability to considerably increase your earnings over time, and the initial investment doesn’t have to hurt. The 2017 Ram ProMaster cargo van is available for a starting MSRP of only $29,945 MSRP*, compared to $31,620 MSRP* for the comparable 2017 Ford Transit. Furthermore, the 2017 Ram ProMaster has several qualifications that place it ahead of the Ford Transit. Read on to learn more, or contact a product specialist at our Ram dealership in Indianapolis at (317) 982-5944 to get details on commercial financing offers and schedule a test drive. The Ram ProMaster is available with either a gasoline V6 engine rated up to 5,100 lbs. towing capacity or a four-cylinder turbodiesel. Likewise, the Ford Transit can be equipped with a standard V6, turbocharged V6, or five-cylinder turbodiesel. For the sake of expediency, we’ll only compare the standard V6 on each. Torque 260 lb.-ft. 260 lb.-ft. 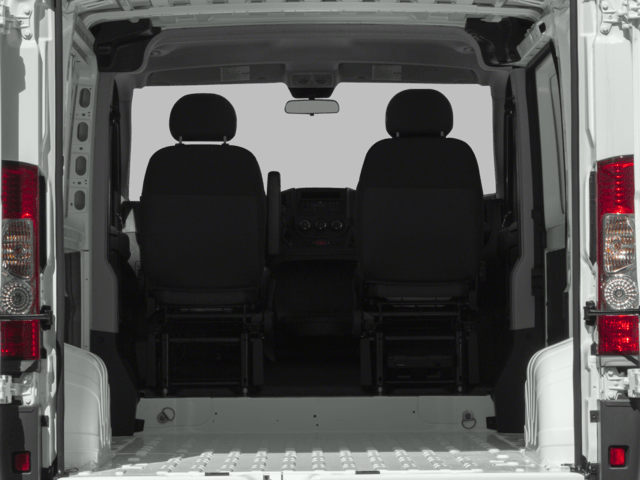 The Ram ProMaster cargo van was carefully designed to ease every aspect of your job. If you need a commercial vehicle for the primary purpose of transporting cargo, the Ram features sliding side doors that open 49-in. and a rear door that opens over 60-in., easily accommodating standard pallets. Additionally, the Ram ProMaster bests not only the Ford Transit but also all other cargo vans in its class for lowest load floor height and best standard cargo height. If you need to upfit your van with storage shelves, you’ll love the nearly 90-degree vertical walls and the high roof of the Ram ProMaster that enable you to stand upright inside. A 2017 Ram ProMaster model with the high roof and long wheelbase contains 420 cu. ft. of cargo space with a payload capacity of 4,430 lbs. For comparison, a 2017 Ford Transit model with the high roof and long wheelbase will only hold 404.2 cu. ft. of cargo and carry up to 4,220 lbs. Purchase the extended long-wheelbase edition of the Ram ProMaster to achieve 463 cu. ft. total cargo capacity. Every business owners wants to know that the vehicle they purchase is going to bring more benefit to their business than the money spent on it, which is why they tend to choose the reliable 2017 Ram ProMaster. Both models come with a three-year/36,000 mile basic warranty and five-year/60,000 mile gas powertrain warranty. However, the 2017 Ram ProMaster has a few extra warranties for your peace of mind. Visit our Ram dealership in Indianapolis today to discuss the best van options for your business or fleet, or contact us online or at (317) 982-5944 to speak with a product specialist now.